Anyone familiar with construction techniques in the Yucatan or other parts of Mexico, has seen the familiar block buildings. Block is easy to work with and makes a reasonably strong structure, if several variables are taken into consideration. 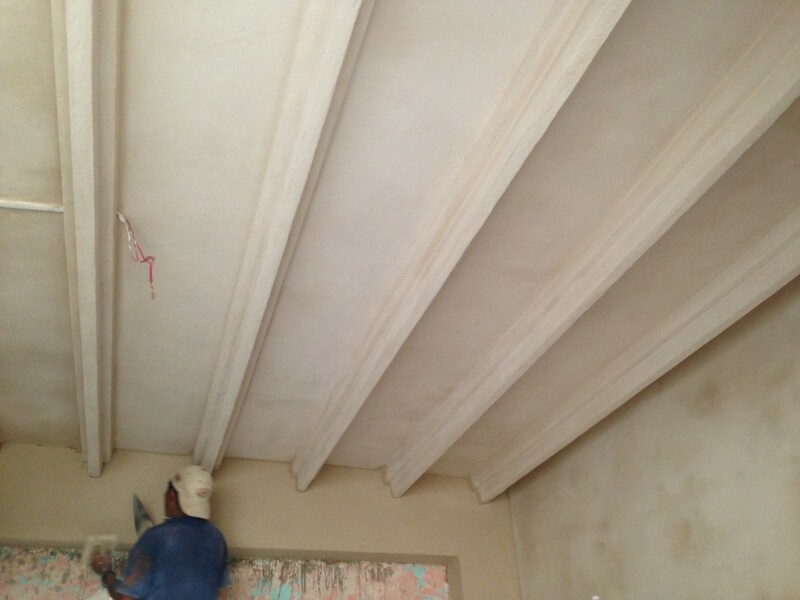 A block structure is only as strong, as the mortar bonding the blocks together and the traditional Viga and Bovedilla roofs are extremely heavy. The other main issue with block construction is heat transfer, as typical block buildings here, do not have any insulation. I have done some testing with a laser temperature gun. On average a block wall facing the Yucatan sun, is approximately 4 degrees C warmer, than a wall not in the sun. That is a very large difference, if you are using A/C in the evening to cool a bedroom. Not only does the A/C have to overcome the ambient air temperature, but it also has to counter the effects of the Blocks radiating heat into the room. There are more modern alternatives to block buildings and one of them is structural panels. Structural panels are an interlinked welded zigzag of wire, supporting a styrofoam core. These types of panels have been used for constructing multi story hotels and are hurricane resistant, they are that strong. Some of the benefits of these types of panels is they are light weight, facilitate a faster build, but also very important is they insulate due to the styrofoam core. The panels come in various thicknesses and sizes, so that they can load a second or more stories or just be the wall for a simple single story home. Structural panels also come especially formed to be roof panels, so the suns energy is not easily transferred to the inside of your home. This also means cool air from your A/C unit does not strike a sun heated surface and warm up. It is the house version of a styrofoam cooler. We have been working on several projects with the manufacturers tech advisor, using these structural panels.. This has offered our clients a lightweight and insulated option for the addition of second stories, as well as the option to build entirely out of the panels for a thermally efficient home. We often, hear complaints from a variety of sources, saying the concrete on counters, walls or floors has cracked. The answer is yes, it cracks and in most cases it cannot be helped. If for example, you raise a block wall from 4 feet to 6 feet, the majority of the time a crack will develop between the new and old blocks. The “why” is simple, expansion and contract at different rates between the new and the old. When a new section is added the new mortar will not be exactly the same as the old and the new blocks will be slightly different in composition as well. The results in one thing, cracking. But rather that go further in explaining the reasons, this information courtesy of The Concrete Foundations Association of America, explains it perfectly. A common adage is that there are two guarantees with concrete. One, it will get hard and two, it will crack. Cracking is a frequent cause of complaints in the concrete industry. The Concrete Foundations Association has produced a new flyer to help contractors educate their customers about the causes of cracks and when they should be a concern. A more detailed explanation of cracking is presented in this article. Cracking can be the result of one or a combination of factors such as drying shrinkage, thermal contraction, restraint (external or internal) to shortening, subgrade settlement, and applied loads. Cracking can not be prevented but it can be significantly reduced or controlled when the causes are taken into account and preventative steps are taken. Another problem associated with cracking is public perception. Cracks can be unsightly but many consumers feel that if a crack develops in their wall or floor that the product has failed. In the case of a wall, if a crack is not structural, is not too wide (the acceptable crack of a crack depends on who you ask and ranges from 1/16” to 1/4”) and is not leaking water, it should be considered acceptable. It is in the best interest of you, the wall contractor, to educate your customers that the wall will crack and when it should be a concern to them. Cracks that occur before hardening usually are the result of settlement within the concrete mass, or shrinkage of the surface (plastic-shrinkage cracks) caused by loss of water while the concrete is still plastic. Settlement cracks may develop over embedded items, such as reinforcing steel, or adjacent to forms or hardened concrete as the concrete settles or subsides. Settlement cracking results from insufficient consolidation (vibration), high slumps (overly wet concrete), or a lack of adequate cover over embedded items. Plastic-shrinkage cracks are most common in slabs and are relatively short cracks that may occur before final finishing on days when wind, a low humidity, and a high temperature occur. Surface moisture evaporates faster than it can be replaced by rising bleed water, causing the surface to shrink more than the interior concrete. As the interior concrete restrains shrinkage of the surface concrete, stresses can develop that exceed the concrete’s tensile strength, resulting in surface cracks. Plastic-shrinkage cracks are of varying lengths spaced from a few centimeters (inches) up to 3 m (10 ft) apart and often penetrate to mid-depth of a slab. Cracks that occur after hardening usually are the result of drying shrinkage, thermal contraction, or subgrade settlement. While drying, hardened concrete will shrink about 1/16 in. in 10 ft of length. One method to accommodate this shrinkage and control the location of cracks is to place construction joints at regular intervals. For example, joints can be constructed to force cracks to occur in places where they are inconspicuous or predictable. Horizontal reinforcement steel can be installed to reduce the number of cracks or prevent those that do occur from opening too wide. The major factor influencing the drying shrinkage properties of concrete is the total water content of the concrete. As the water content increases, the amount of shrinkage increases proportionally. Large increases in the sand content and significant reductions in the size of the coarse aggregate increase shrinkage because total water is increased and because smaller size coarse aggregates provide less internal restraint to shrinkage. Use of high-shrinkage aggregates and calcium chloride admixtures also increases shrinkage. 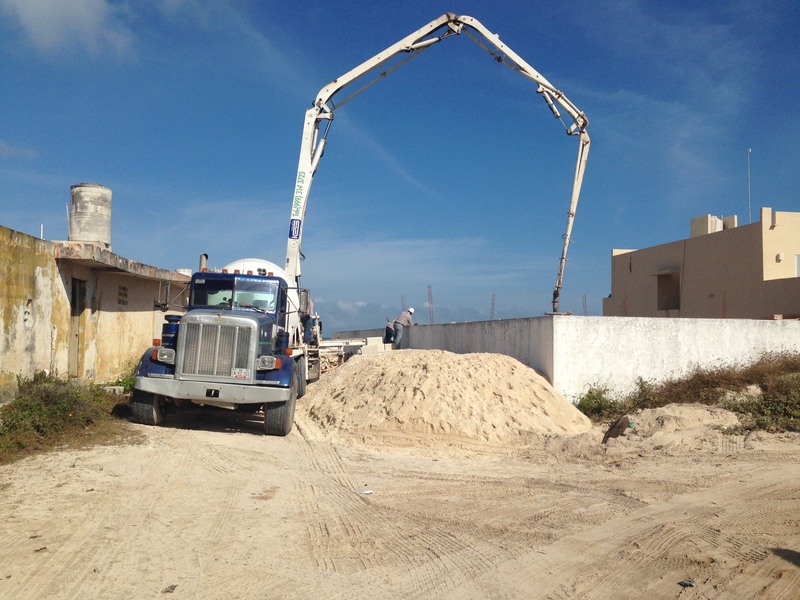 Within the range of practical concrete mixes – 470 to 750 lb/yd3 (5- to 8-bag mixes) cement content – increases in cement content have little to no effect on shrinkage as long as the water content is not increased significantly. Concrete has a coefficient of thermal expansion and contraction of about 5.5 x 10-6 per °F. Concrete placed during hot midday temperatures will contract as it cools during the night. A 40°F drop in temperature between day and night-not uncommon in some areas-would cause about 0.03 in. of contraction in a 10-ft length of concrete, sufficient to cause cracking if the concrete is restrained. Thermal expansion can also cause cracking. Structural cracks in residential foundations usually result from settlement or horizontal loading. Most (but not all) structural cracks resulting from applied loads are nearly horizontal (parallel to the floor) and occur 16” to 48” from the top of the wall. They are much more prevalent concrete block construction. They can be brought about by hydrostatic pressure or heavy equipment next to the foundation. Diagonal cracks that extend nearly the full height of the wall are often an indication of settlement. In either of the above conditions, an engineer should be consulted. Diagonal cracks emanating from the corner of windows and other openings are called reentrant cracks and are usually the result of stress build-up at the corner. Diagonal reinforcement at the corner of openings can reduce the instance of crack formation and will keep the cracks narrow. 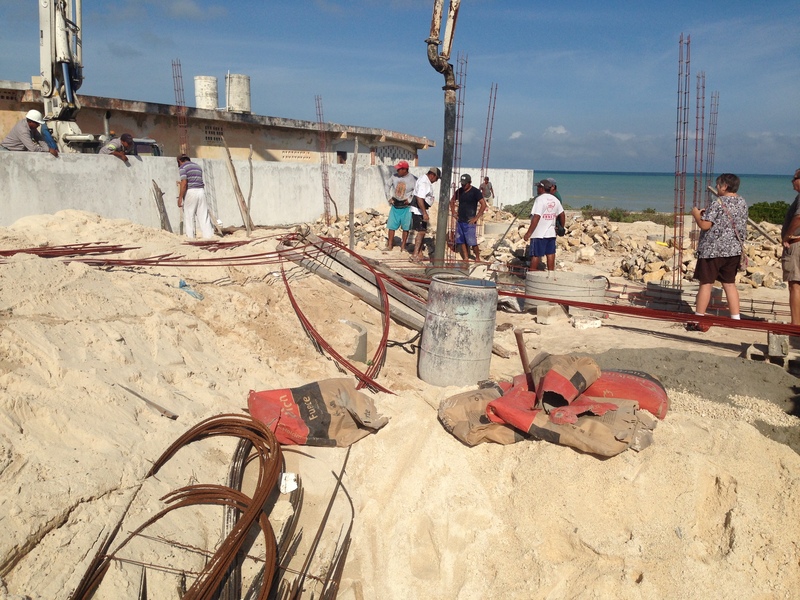 The old ways of construction in the Yucatan, as far as building on vacant land is concerned, have changed dramatically over the last few years. The environment agency of the Government SEMARNAT is heavily involved in the process. SEMARNAT is in charge of the protection of natural habitat. That includes any building lot you may buy and wish to build on. The restrictions and processes you have to follow vary, dependant on the zone you are in. But first you have to have an environmental assessment done and this is submitted to SEMARNAT. SEMARNAT will use this assessment to review your plans to build. Most homes will end up being built on Pylons like this one we are doing for customers in Chelem. Building on pylons is better for the flora and fauna, as well as provides better protection from storm surge. A lot of places that may suffer hurricane damage require homes to be built on pylons by law. But building on pylons requires special engineering and techniques which adds to the costs. In some areas SEMARNAT specifies even swimming pools must be elevated and the level of elevation can vary zone to zone from ground level to 2 meters above terrain height. If you are looking at a lot to build on call us, before you buy, to make sure you will be permitted to build what your planning. Some lots would be almost impossible to build on due to the restrictions in place. A normal SEMARNAT review can take 6 months or more, so that has to considered in your overall timeline as well. We have one customer, that had a large parcel of raw beach front land, in a non built up zone, take 8 years to finally get permission from SEMARNAT. We can help you though out the permitting process, as we know what to do and how to do it. Questions you need to ask your builder, before you start. Here are some questions you should ask of any prospective builder, to give you an idea of their ability to do the task at hand. I have put in my answers for each question, just as a reference. Are you a registered company and do you have a company website? How many people – direct employees – work for your company? This answer will give you an indication of company depth. It varies as projects come and go, but we keep a core group that have been with us for 7 years and expand as required, right now it is about 40. What are their job descriptions? This answer tells you if the contractor has adequate support staff. Some are master Abiniles others are helpers. We also have 3 support trucks, for our supervisors who try and visit sites daily. We also have plumber electricians on staff, plus an engineer and architect. What do they do each day? You should get a feel if the people are full or part time. We put dedicated crews on each job and the service trucks visit each site at various times during the day delivering materials and checking the progress. Our supervisors visit projects daily to review the progress and one of the other partners or perhaps both of us, will also show up and check quality independently. How many jobs does your company have in progress right now? Will your job be lost among these? We have several major projects in progress and 7 smaller ones, right now. We won’t take on more till one wraps up. We have projects that are waiting till a crew comes free. Do you have any other outstanding bids right now? If these turn into jobs, will your job drop to the bottom of the list? Of course, if we waited to bid on contracts until jobs were finished we would be too late to bid. But we start new jobs in the sequence we get them. Do you work from your home? This can be a sign of under-capitalization. I never had an office of my own, so ask more if this is important to you. 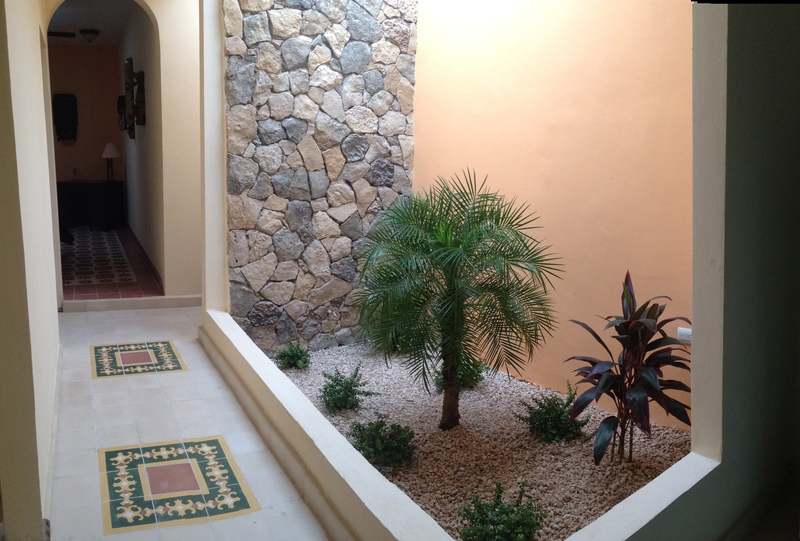 Yes, it is better for me, but we also have an office/storage place in Chelem and a formal meeting space in Merida. How do you manage your jobs on a day-to day basis? All jobs require management. Ask for details! Who checks for quality, mistakes and progress? There are 2 partners in the company, we are on the road at various times reviewing the projects. When mistakes are made we correct them and make sure the workers understand the issues. All the major jobs have timelines posted, along with our company standards, for all employees to see. It is not practical on smaller jobs. Have you or your company ever been sued before? The truth is available in the courthouse records! What is the worst building experience that happened to you? Listen! What is the story behind the tale? We have had customers that were impossible to please and changed their minds on things mid project and blamed us, when the job went longer than planned. It all worked out in the end, but it was frustrating. What has been your best building experience? Listen! What is it he/she likes to do? Ask why. Actually most of our past customers are now current friends, it is fun to do projects where the customer has a vague idea of what they want and we can guide them, to get the dream job completed for them. Are the words quality, customer satisfaction in the answer? If you hear, “…make a lot of money…” WATCH OUT! To keep a good quality crew, busy year round on interesting projects. We are in the process of working on several major renos, as well as a couple of structural renos in older houses. Structural engineers are involved, our architects, we have various ideas. It is fun for me during the design stage and my partner are more active in the overall building phase. What is the longest amount of down-time you experienced between jobs? A contractor in demand has little or no down time. Maybe a week or so as we had to wait for permits. Do you use sub-contractors? Most contractors do. Yes, but we usually end up hiring the best of them full time. What is average length of time they have worked for you? You are looking for 5 or more years here! Can you provide me with a list of customers I can contact and can I see samples of your work. Absolutely, we can show you for example, various renovations, many of which required structural engineering and from the ground up homes. 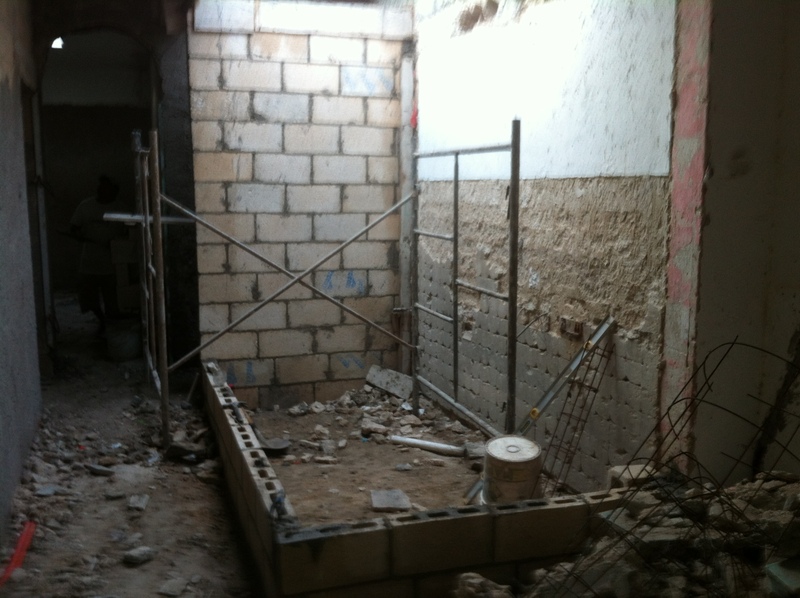 Structural reno’s, are actually the most challenging as it is not as easy, as building from the ground up. 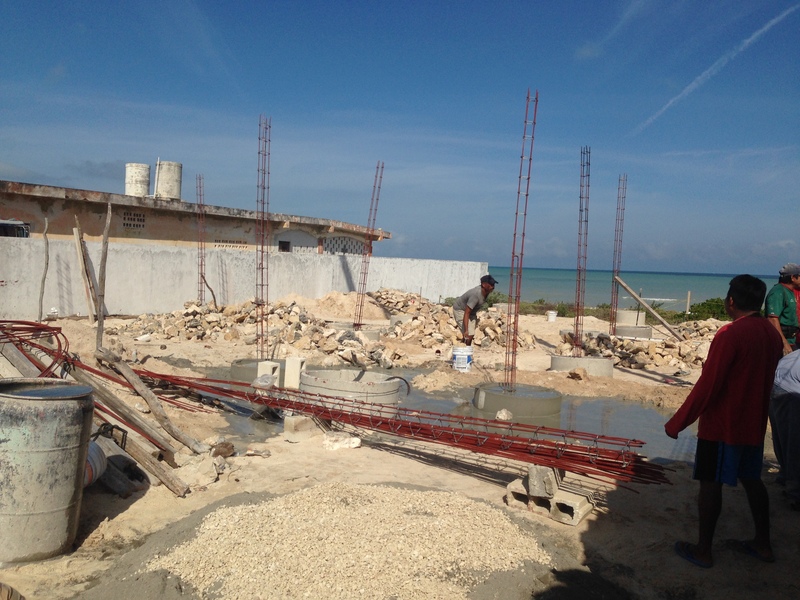 We have built projects in cellular concrete, to keep the third story weight as low as possible, (boutique hotel) and have finished building a new house on pylons, for hurricane protection. 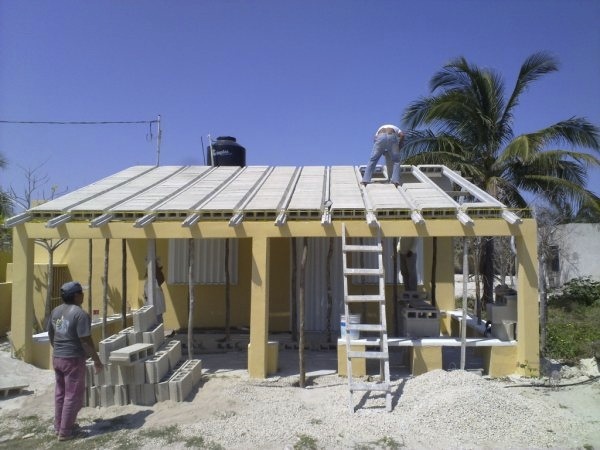 We have also built and remodeled homes using structural panels for hurricane resistance. In addition to the 100 or so custom pools we have designed and built. 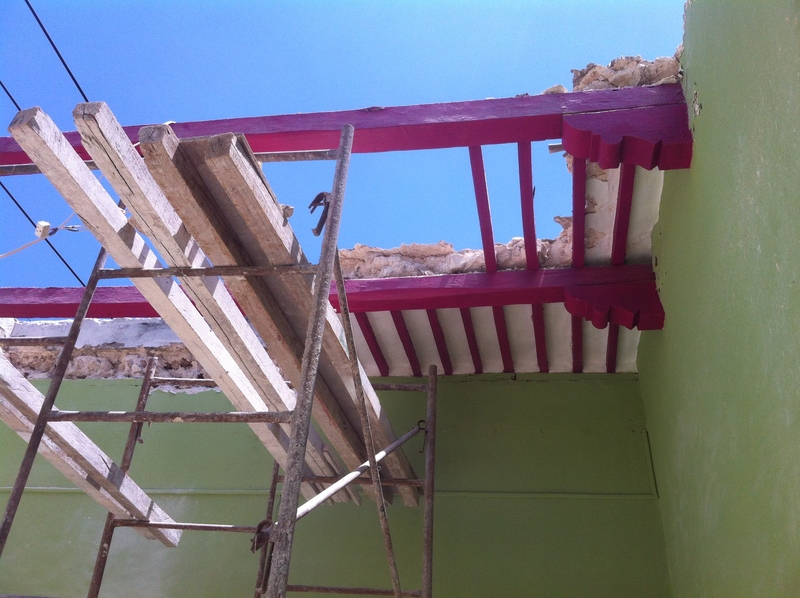 There seems to be a lot of confusion when it comes to roofs in the Yucatan. There are basically 4 types of common roofs here, they are Palapa, Mamposteria, Loza and Viga with Bovedillas. All have their benefits and draw backs and I will go through each type, but the one thing they all have in common, is replacing a roof is expensive. 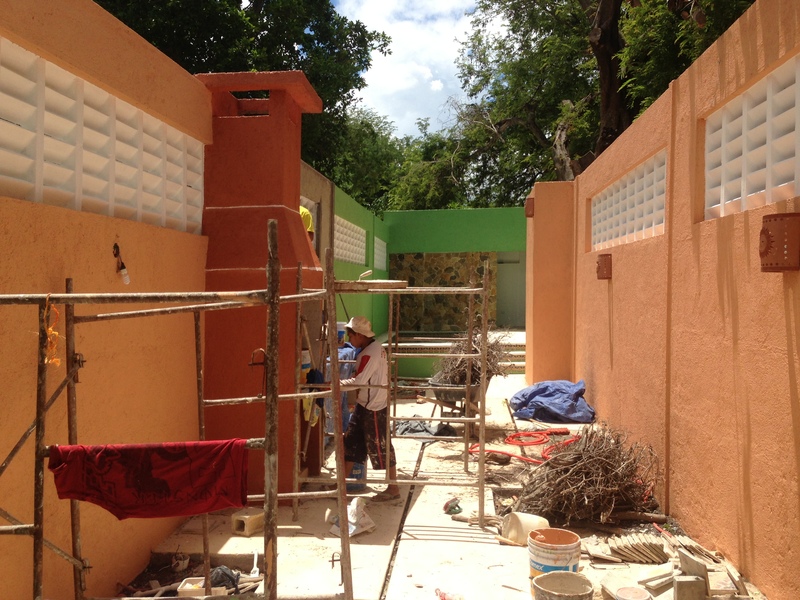 Palapas, are pretty self explanatory, they are the traditional method of building a roof in the Yucatan. Upright posts, support a series of beams, set at a steep angle. Onto these beams are laid an overlapping sequence of palm leaf or grass thatch. The roof needs to be steep to allow the water to flow down over the top of the thatch, rather than sitting on top and dripping through. This was an ideal way in the old days, to make a roof that could breath and still flex under strong winds. When the worse case scenario happened and your roof blew off, it was just a matter of going out and gathering the materials to rebuild it. It is still quite common to see palapa roofs as outdoor shade areas or in traditional looking buildings. Several large restaurant chains here still use them to retain the old world charm. But like many things, they have their drawbacks. The thatch does not last forever and needs to be replaced. It also needs to be treated for bugs as thatched style roofs are nice nesting spots. The support poles need to be made of a very durable hard wood as well. Otherwise boring beetles and other wood pests will soon bring the roof tumbling down. Mamposteria, is also a very old method of building a roof, but it is a solid structure unlike a palapa. Mamposteria roofs last a very very long time, but not forever. Mamposteria is simply a jigsaw puzzle of larger stones fit together over beams of wood or in some cases old railway ties. The stones are fitted and cemented together and then coated in the same cement like compound to provide a tough and durable surface. There are lots of Mamposteria roofs in the Yucatan that are well over 100 years in age. 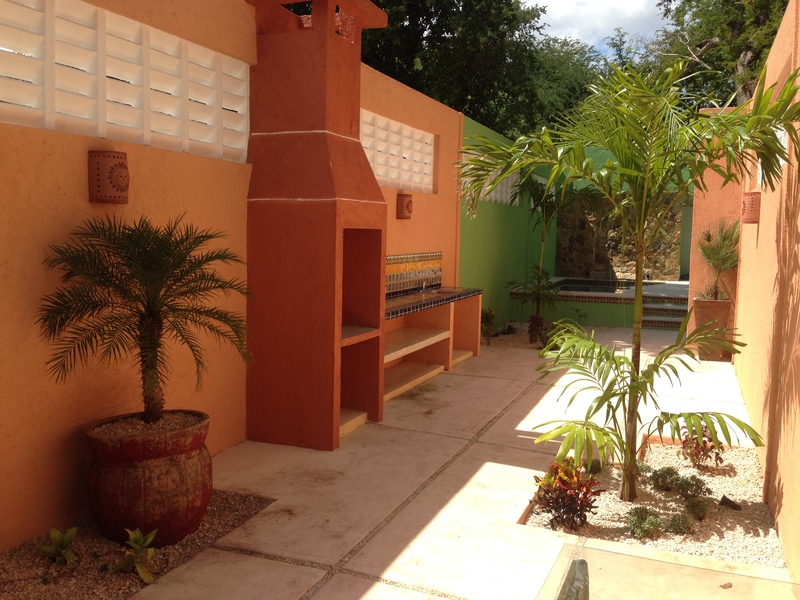 Mamposteria roofs are fantastic in tropical climates due to thermal mass. Thermal mass ensures they heat up slowly and cool slowly. So during the day they are slow to radiate heat into your house. Then at night they release the heat over the course of the night keeping a room at a constant temperature, more or less. The problem with Mamposteria is two fold. They are extremely difficult and expensive to repair, if they can be repaired at all. The other problem is the wood support beams. Most are made of a very good and rot resistant wood. But over time they do break down and can be attacked by termites. once the wood is affected it has to be replaced, but it is holding up the stones and cement. Since the stone and cement is like a jigsaw puzzle, if one piece is removed or fails then the rest will follow it, much like a house of cards. If you are buying or renovating a house with mamposteria roofs, do your homework and any sign of termites means you could be in trouble. Loza roofs are a little more modern, in that they are probably less than 80 years old. Loza is simply a rebar reinforced thin concrete roof. The problem with Loza, is it relies on the rebar for its structural strength. If the rebar rusts far enough, it will fail, as the structural integrity is lost. Common signs of rebar failure or rust is a bulging spot on the ceiling. There are methods of engineering support in the event of the rebar failing. But it is not cheap and involves building columns and beams to support the roof from the bottom. It can be made to look like an old colonial mamposteria roof and can be made to last a lot longer as well. But it involves making holes in floors and building the proper structure. Like the one pictured. Note, the loza is above the new beams built to support it. You do not want to be under one of these roofs when chunks of concrete come raining down. The most modern of the roofs here, are Viga and Bovidilla. Vigas are a rebar reinforced beam that spans a gap like an upside down T. Bovidillas are specially shaped cement blocks designed to be dropped in between the vigas, which are spaced roughly 16 inches apart. Once the basic structure is in place it is coated with a layer of concrete on top and coated underneath as well. This type of roof can easily be repaired as needed over time. Bovidillas are also available now in Styrofoam to save wieght and give insulation. But they require special care to insure they don’t flex and cause cracks in the finish. 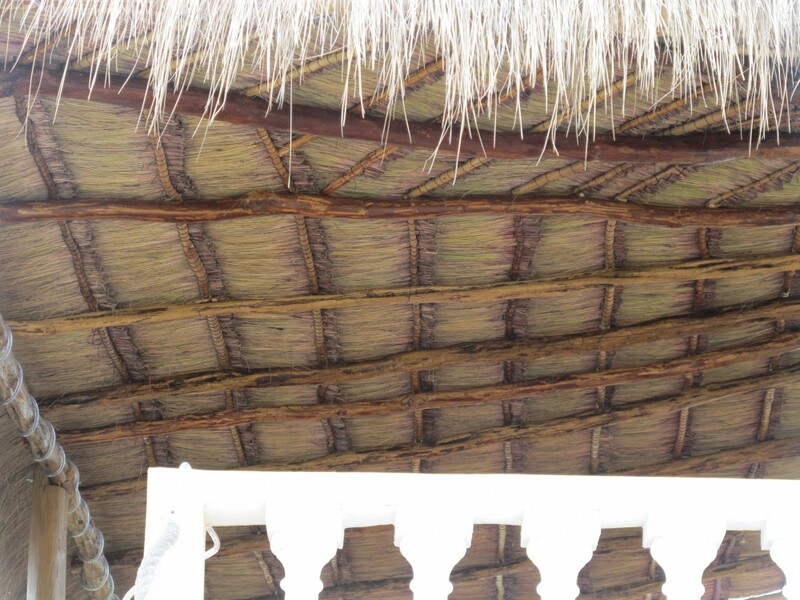 The one thing all of the above roofs have in common, even a palapa style, is maintenance. Roofs need to be treated, resurfaced periodically and sealed to prevent moisture intrusion. Failure to do proper maintenance, is not a cost effective idea as sooner or later, it will fail from neglect and require a very expensive replacement. If you have concerns or questions about your roof, just give us a call or send us an email. It is that time of the year again and we will start getting panic calls. My windows leak, my door lets in water, my roof leaked and so on. When we ask when was you roof last sealed, quite often the answer is gee I don’t know. You should know and you should check your roof on a regular basis, to make sure there are no cracks forming. A properly built home, should not leak, sure water may blow under the front door. But the roof and walls should be secure. Obviously, I understand the floors here are tile and the buildings block and concrete, so even if it gets in, it is no real issue, but it should not happen, water should stay on the outside, in anything short of a hurricane. I will start by talking about doors. Which seems pretty simple, but it is not. If you have a wood front door, sooner or later you may have issues, as the wood shrinks when dry and swells when wet, creating a loose fit or a tight fit, season depending. In the old days, when fishing boats were made of wood, they had to keep watering down the insides of the boats, when they were hauled for repair, to avoid shrinkage. You can imagine the problems of putting a dried out wooden boat, back into the water, as it takes a few days for the wood to swell to normal. Well, your door is no different, it sits in the beautiful sunshine for weeks and then suddenly needs to seal against the rain. It simply is not going to happen, it is going to leak.. Then there is the issue of the floor under the door, if it raises ever so slightly as it goes inward as it should, a door will bottom out before it gets fully open. But since we want water to run out of a house and not into a house. It should be sloped and the door needs to be a little bit off the floor, to accommodate the rise in the floor. That is why the bottom of your door, should have a good rubber sweep. It keeps the rain out, as well as a lot of bugs. But they harden over time and need to be replaced, every so often. The best door to use here is a metal skinned one, they don’t shrink or swell. They are very secure and never need painting, unless you want a pink one. They can make a very good seal as well, if you use self adhesive foam weather stripping on the closing edges of the door jamb. How about windows? If they are wood you will have the same issues. A properly fit and caulked aluminium window, will not leak no matter how hard it rains. Proper windows have drain holes at the bottom outside of the casement and the outer raised lip is lower than the inside raised lip. Rain can never rise up high enough to go inward before it spills over the lower lip if the drain hole get plugged or overcome by rain volume. I have a seaward window, that looked like it was being hit with a fire hose the other day and guess what? Not a single drop inside. A proper window makes all the difference. Sliding glass doors are actually big windows, so the same principals apply. Proper caulking and manufacture and they will not leak. Since for the most part when it rains here, it is accompanied by strong winds, all your windows and doors should have an awning over them, concrete ones are simple and cheap and there are various aluminium or tile styles too. It just adds a little rain protection by itself, but there is a hidden advantage, if you have aluminium hurricane shutters. Even in the hardest rain and driving winds you can leave windows open, with the shutters closed for air circulation. If the top of the shutter is close to the awning, no rain can get on top and the shutter itself is the barrier. Sliding doors are a little bit wetter, as the rain can bounce off of the ground up under the bottom of the shutters. But, I simply put flat plastic panels at the bottom of the screens to prevent splashing. The shutters have the added advantage of being a great theft deterrent, if you happen to be away, as well. If you are having water get into your house when it rains, you shouldn’t and it is not too difficult to prevent. If you need serious help give us a call.